Coal is in the forefront with a double digit increase (+61%). It is followed by ore (+30%) and fuel (+18%). Results in those cargo groups were possible due to an excellent economic growth in the country. Rapid economic growth triggered higher demand for energy resources and raw materials for the production of steel. Last year, other bulk had very good results (+10%) due to increased handling of fertilizers, aggregate, methanol and sulphuric acid. Further growth was noted by break bulk (+4.4%), including break bulk transported by ferries (+3%). Unfortunately, grain handling was still poor (-25.1%), and a big surprise was the double digit in container handling (-13%). In total, the two ports handled 3,190.6 thou. tons more, i.e. from 25,423.6 thou. t in 2017 to 28,614.2 thou. t in 2018. This translates into an increase by 12.5%. An interesting fact is that already in the middle of November 2018, the ports reached the level of the whole year 2017 (25.4 m tons). ‘Results attained by our ports was the effect of the synergy between actions taken by the Ports Authority, on the one hand, focusing on the development of port infrastructure and creating possibly the best conditions for business in the ports, and the operation of port-based companies, on the other. Moreover, the Polish economy was rapidly growing as reflected by imposing port cargo handling statistics. The results are motivating for us to continue promoting further growth in the ports of Szczecin and Świnoujście,’ commented Dariusz Słaboszewski, CEO at Szczecin-Świnoujście Seaports Authority. The Ports Authority expects the upswing trend to continue in 2019 to reach cargo handling about 30 m tons at the year end. We should remember, however, that the situation on the market fluctuates and certain factors may remain beyond the control of the Port Authority and handling companies, which this may have its impact on cargo volumes. It is worth noting that the Ports Authority and port companies have been active in their effort to attract new cargo. It includes plans for investing in port infrastructure. The Ports Authority Investment Plan designates PLN 1.5 bn to be invested in the ports of Szczecin and Świnoujście in the EU period of 2014-2020. 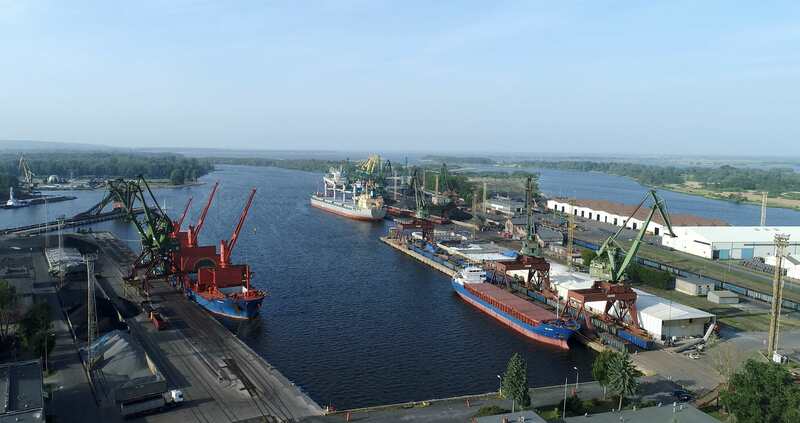 The Ports Authority intends to modernise quays in Szczecin in the vicinity of the Dębicki Canal and Kaszubski Basin. The quays will be upgraded to meet requirements of the Świnoujście-Szczecin fairway after dredging to 12.5 m. Port infrastructure will be extended and modernised in the two ports. In Świnoujście, a new ferry terminal will be built to handle intermodal transport, whereas in the LNG terminal, a new jetty will be developed for further distribution of LNG. The port of Świnoujście will also have new deep water quays. Moreover, in the nearest future, other organisations are going to invest in port access infrastructure, including dredging and modernisation of the Świnoujście-Szczecin fairway to 12.5 m, extension of S3 expressway, and modernisation of railway lines and the improvement of the navigation capacity of the Oder Waterway. All the above mentioned activities are designed to enhance competitiveness of the Szczecin-Świnoujście Port Complex. The expected effect includes growing volume of cargo handled year on year. P.S. According to statistics, the largest ever cargo handling in the ports of Szczecin and Świnoujście was in 1979. That year, the ports handled 26,697 thou. tons.